The dining room is that room in your house that comfort must reign after all is where you’ll spend memorable moments. Choosing the right round dining tables will help you to create a cozy and modern decor. Have you thought that round tables are perfect to gather friends and family, talking and laughing? That is why we have chosen 10 modern dining rooms designed to welcome and celebrate with your guest. Rounnd dining tables fit any style, can be colorful, minimalist, industrial or vintage style. Get Inspired! Patch Table has intricate wood veneer top and sculptural base for adding sophistication to any kind of home setting. Patch table fits on a contemporary dining room or on a sophisticated kitchen. A simple wooden table can have a fantastic impact on your décor when combined with the statement chandelier and design dining chairs. Marble dining tables are a classic that brings sophistication to any room. Wormley is a round dining table from Essential Home that features a skillfully engineered structure made of pipe rings, a hallmark of excellence in metalwork that supports a clear glass on the top. A perfect centerpiece for the engineering minds. 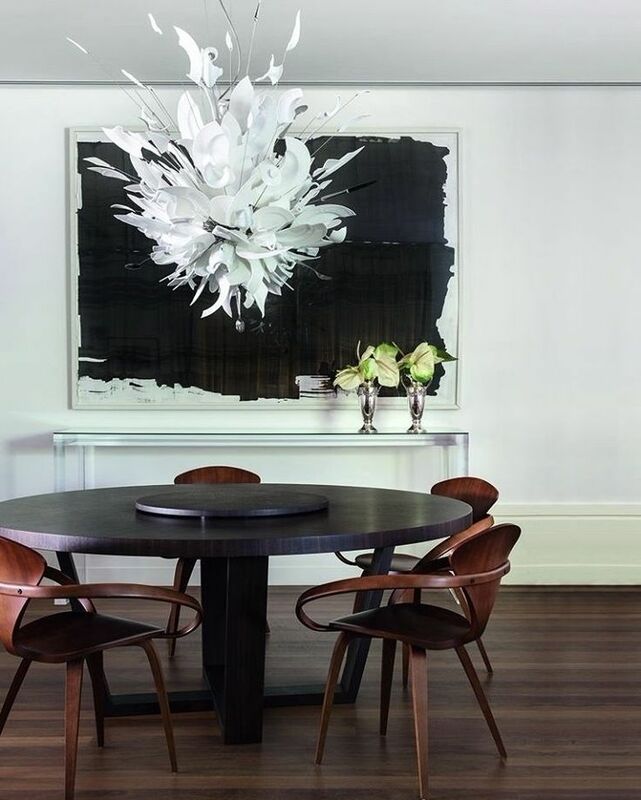 An elegant dining room designed Tamara Megel, the dark roundtable let the Lindsay Adelman light fixture stand out. The Bonsai Dining table boasts bold lines and character in a fantastic blend of styles and material finishes. A balanced decor by Carden Cunietti, the roundtable enhances the coziness of this room. AGRA dining table, from Brabbu is an impressive display of craftsmanship and elegance. Its delicate work of the robust white stone softens the imposing structure, while touches of brass reﬂect golden warm tones to the polished surface. The luxury Littus Dining Table, from Luxxu, has come to symbolize the spiral, is a curve in the space, which runs around a center in a special way like the great decisions are taken around powerful tables among determined minds. A minimal dining room created by Studio Pepe, where the brass dining table fits flawlessly.